1. What character do you play? I play Blondy Swanson, a brokenhearted and recently retired bootlegger. 2. Favorite part of working on this show? Working with people I know and love. It’s like coming home. It’s hard to choose. There are a lot of fun and funny scenes in the play. But there’s one in particular towards the end of the play that is very sweet and simple. It’s with Victoria Mack and she’s just so easy to play with. 4. When did you first decide to be an actor? Why? I was a weird kid, a latchkey kid. I loved old movies and magic and ventriloquism and anything theatrical. I was raised by a single mom and she was always looking for things for us to do, just to get a break from us! I was ten years old when she got me started at Young Actors’ Theatre. It was run by a woman named Charlotte Kaufman, a Goodman Theater trained actress from Chicago. We rehearsed and performed in this beautiful old Victorian playhouse in downtown Indianapolis. It was run-down and dusty and dangerous and we spent a lot of time running around exploring. I was hooked from the very first play I did. 5. What do you do to prepare for a role? Beforehand, I spend a lot of time with the script — looking for any particular tics or traits my character might have. Figuring out my thoughts and feeling in relationship to other characters in the play. If it’s a historic play I like to do a lot of research into the period or the culture. Books, documentaries. Anything that helps to make it more real for me. But I tend to discover most things just by trying them out in rehearsal. I’m not a big one for talking because that gets me in my head and makes it harder to find my motor. I learn most in the doing. 6. How has TACT grown and developed since you first became a company member? Well, I’ve only been a member for a couple of years. But I have had a relationship with TACT for much longer. I think I auditioned for something back in the 90’s. But my first real experience was seeing Jenn Thompson’s production of ECCENTRICITIES OF A NIGHTINGALE. I was knocked out by it. It was clear that the company model was what made this group so special. Too many to choose from. The backstage dressing room during BEYOND THERAPY was one of the best rooms I’ve ever been in. I directed my first salon reading (this season’s HOLIDAY) and was blown away by the talent and collaboration from the cast. And last year Scott asked me to develop a new project for the company on the theme of “aging”. Workshopping the Devised Works Project, as it has come to be known, has been very exciting. 8. Runyon’s characters always have colorful names. If you were to give yourself your own personal “Runyonesque” name what would it be? And why? That’s a tough one. I handle most of the projection lighting for the shadow puppetry in the show, so let’s go with “Johnny Flashlight”. 9. For those individuals who participated in the New TACTics reading of Three Wise Guys: How has the show grown and changed since then? It was pretty well cooked when we did the first reading last spring. The New TACTics workshop over the summer allowed for a bit of tinkering but the script has been remarkably consistent throughout. And the cast is all old-timers too. Every person in this production was involved in at least one of the two previous readings. 10. What do you hope the audience will take away after seeing this show? It’s a fun story, certainly, but there is a deep melancholy in Runyon’s writing that Scott and Jeffrey have really captured. Many of these people are at a crossroads. They are filled with doubt and regret and are looking for their paths forward. This is a very hopeful story of second chances. With all the fun and laughs, I hope we can convey that. 11. You’ve appeared in a number of shows on Broadway, including the musicals Fiddler on the Roof and Mary Poppins. How different it is to appear off Broadway? It’s funny. When FIDDLER closed I was saying how much I missed playing in an intimate space. The Beckett is exactly where I want to be right now. There is an intimacy off-Broadway that makes it easier to reveal yourself. In most Broadway houses, it’s a balancing act between the front row and the balcony. You have to tell the story in such a way as to convey it to the back of the house without overpowering the people sitting closer to the stage. Doing a show like this at the Beckett means we can play with a kind of subtlety that allows things to be both broadly funny and quite moving at the same time. Or at least that’s the hope. 12. Do you prefer acting in plays or musicals? Musicals have a lot more components and, frankly, they tend to have larger budgets. Those things can actually be helpful to an actor. It’s a lot easier to fall in love onstage when the orchestra actually swells. So, yes, they do a lot of the heavy lifting for you. But a good musical comes together just as a good play does. It requires honest and committed storytelling. Otherwise its just spectacle and that doesn’t interest me. But if I had to choose, I would do a straight play with the bare minimum. I’m interested in what connects two people on a stage. I don’t need much more than that. 13. You’re the producer of a popular webseries called Darwin. How did that come about? And how different is it to produce an Internet series versus appearing live on stage? My creative, hilarious, kind collaborators. Hmmm….talking to Blondy in the barn. It’s so sweet. I saw A Midsummer Night’s Dream in London when I was 8 years old and fell in love. From then on all I cared about was theatre. I was a goner. For this play I followed Scott’s suggestions in order to learn more about the period. Other than that, I’m a big believer in discovering my characters through playing with my castmates during rehearsal. I learn more from doing and playing than I ever could from working my own. I’ve loved seeing TACT’s play choices change since I joined. The company has branched out from the original mission and has been working on more contemporary pieces like Abundance, Hard Love, and new pieces like Gravedigger’s Lullaby and Three Wise Guys. Every salon. They’ve been so fun, so joyous, and so challenging! Getting to dive in and perform a play with only a week of rehearsal is an amazing experience. 8. Runyon’s characters always have colorful names. If you were to give yourself your own personal “Runyonesque” name, what would it be? And why? “Vicki the Mack” has a pretty nice ring to it. 9. What do you hope the audience will take away after seeing this show? 10. What’s it like playing multiple roles in this show? How do you differentiate between the two? Accent helps, and vocal pitch. But the two are drawn so distinctly by the playwrights that it’s not difficult. I can lean on the dialogue and the situations. 11. In addition to acting, you’ve built a successful business as an acting coach. How did that come about? And what’s your favorite part of coaching? I started coaching years ago with 1 friend who wanted to work on an audition and I fell in love. I love seeing a student grow and change. And I love seeing them get into a school! 12. What’s it like appearing in a brand-new play compared to a familiar one such as many of the Shakespearean plays you’ve been in? I play an aging tough guy called “The Dutchman”. Nobody knows his real name, but in this world, real names are not important. I’m a huge fan of Damon Runyon’s short stories. I’ve been in two productions of “Guys and Dolls” and I’ve read pretty much every word Runyon ever wrote. He’s got a completely original voice combined with a keen (sometimes macabre) sense of humor, a joy to read. I’m surprised more of his work has not been put on stage. The company is relaxed and professional and makes me feel at home. Scott is a seasoned professional and I’ve worked with him four times before and it’s always a pleasure. Hm. Favorite scene. That’s tough. They’re all fun. I suppose the scene in the mansion where everybody is on stage, Heine trying to knock off Dancing Dan, the three wise guys trying desperately to get away from Heine, Muriel trying to make sure Dancing Dan is safe while performing at the party, Myrton trying to keep his job and satisfy his employer so he’ll get his Christmas bonus, Bitsy trying to keep her party going strong and eliciting contributions for her pet project…it’s almost a farce (without the slamming doors!) at this point with everyone pulling in different directions. My father and mother both started out as actors so I guess I always had it in my blood. My father was an assistant director in film and television so I spent a lot of time on sets when I was a kid and I always enjoyed it. Our next door neighbor was a very successful character actor named Strother Martin and he was a huge influence. He always played the nasty, sleazy, unlikeable characters convincingly, but he was the sweetest human being so it was obvious that he was a great actor. My father worked with James Garner several times so I also had the honor of watching him work. I have never seen another human being with his flawless timing and unflappable nature. A brilliant actor. Every role is different, but in this case there was some research involved, including re reading the Runyon short stories the script is based on, watching Ken Burns’ documentary “Prohibition”, listening to music from the era, checking out what was going on in New York in 1932, etc. I’ve also watched a few films from the era which helps immensely. Figuring out who the character of the Dutchman is and what he wants, what he’s willing to do to get what he wants, and what’s standing in his way is also extremely helpful. Well, the people I’ve met have all been enjoyable, but I think waltzing with Nora Chester in The Good Soup has to be the highlight! I would be known as Botticelli Jones. I don’t know why, it just sounds good. Since the reading, the script hasn’t change all that much, but the characters have all evolved a lot. There have been minor changes along the way which are beneficial, but the story is the same entertaining yarn. I hope the audience will take with them some laughter, some holiday cheer (even though it’ll be March or April! ), and some memorable characters and situations, plus maybe a heightened appreciation for Damon Runyon’s stories. 11. You’re the only member of the cast who isn’t a company member of TACT. What’s it like being a guest artist? I have been made to feel like a pariah and outcast. No, seriously, I know Karl, Dana, and Ron from the reading, so that’s been very comfortable, and the others have been very welcoming. We’re all actors and have the same intention of telling a story in the best possible way we can. 12. When you appeared in the developmental reading of Three Wise Guys last year, you played a different character than the one you play now. What’s that like? I actually did play The Dutchman in the reading so that hasn’t changed, but the character has evolved into a slightly different entity (I hope). 2. Favorite part of working on this show? Favorite scene? My favorite scenes and my favorite part of working on this show is all of it, because it is simply funny and has a a real New York feel. 3. When did you first decide to be an actor? Why? I don’t remember a time when I didn’t want to be an actor just as I don’t remember a time when I didn’t like sweets. 4. How did studying at Yale prepare you for your career as an actress? Oy. Thank heavens I went to Yale Drama School because they saw to it that I could play anybody…..even her. 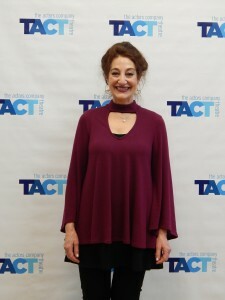 TACT provides all sorts of challenges to the company in its Salons and full Productions which brings me to my favorite TACT memory. It would have to be walking into our space on the 9th floor of 900 Broadway for the first day of rehearsal for THREE WISE GUYS. I knew everyone. I had worked with everyone. I had enormous love and respect for all in attendance. It was a remarkable feeling of well-being and joy. 6. Runyon’s characters always have colorful names. If you were to give yourself your own personal “Runyonesque” name, what would it be? And why? If I could choose a name for myself based on one of my characters it would be BUBBE O’NEILL because it is simply funny and has a real New York feel. 7. In your free time, you’re an accomplished baker. What do you like most about baking? And is there a connection to your acting? This is my penchant for baking and its connection to acting. Its a lot of work and no money in both arenas. Both involve a hard to describe alchemy between intuition and craft. Both require an audience. This is where you all come in. Come to see THREE WISE GUYS for a fun, sweet slice of old New York!!! The laughs we have in rehearsal. The camaraderie with good friends and artists. My favorite scene is my very first scene when Heine comes in and scares the heck out of everyone. It sets a large part of the plot in motion. I had been doing plays for some time in high school and college. Then I was taken under wing by a couple of actors from the Royal Shakespeare Company while in college. They encouraged me to seek further training and to give it a try professionally. When I got to graduate school, the possibility of Theatre as a vocation was introduced to me and I have stayed with it ever since. I learned the lines and blocking. And worked on my dialects. 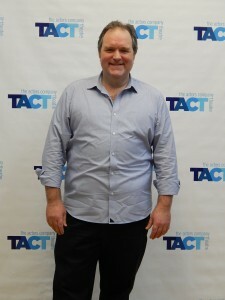 I first worked with TACT in 1996, and became a company member in 2000. 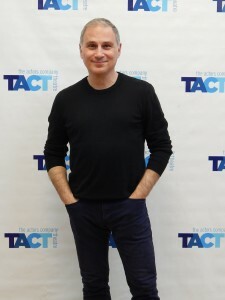 Since then TACT has become my artistic home in NYC and grown to be a bigger part of my life as people I only worked with have become my dear friends and are now woven into my life. There are so many, but here’s one … in the fall of 2014 I directed a Salon of Neil Simon’s “Come Blow Your Horn.” I had come up with a couple of ideas about staging the play that I believed would help the audience follow the story since we are working without a set and no props. There are three phone calls in the play where the mother is trying to take a message but cannot find a pencil. At all. Anywhere. So I had Nora Chester, stalk the stage looking for a pencil but never finding one. Late in the play one of the sons decides to leave a note. I had him sit down center stage, preoccupied with writing his note. I had him reach for, and absentmindedly say “pencil” as he was beginning to write. I brought the house down with laughter. When things like that happen the Theatre is so satisfying. Maybe Johnny the Greek, or Greek Johnny. Because I am of Greek descent. I hope they’ll come away believing that life can offer second chances, and that they themselves can offer the possibility of second chances to others in their lives. 10. 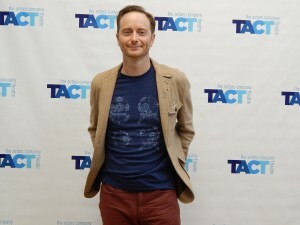 In addition to acting, you’ve done a lot of directing at TACT. What’s that like? 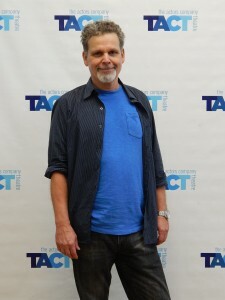 And what’s your favorite show at TACT that you’ve directed? Directing is very satisfying. I work on the play for weeks, even months before. I feel like I almost know every line and get to play every part. At least in my imagination. My two favorite TACT directing forays are Noel Coward’s first play, “I’ll Leave It to You”: so full of style, whimsy, and dangerously sharp wit. And Neil Simon’s “Come Blow Your Horn”: how the deep pain of family dynamics can yield so much laughter as we watch it in others. 11. How did someone with a political science degree become an actor? And has that background helped you in your career? 12. What’s it like playing multiple roles in this show? How do you differentiate between the four? Do you have a favorite? I like playing Heine, because it’s always fun to play the bad guy. I differentiate among them by vocal, physical changes. Changes of costume. Oh and the lines. The lines are different for each character. So it’s impossible to mix them up. It’s been fun creating something entirely new. A World Premiere is always fun. Tough, but fun. 3. Favorite scene in the show? In this show I tend to like the quiet, and reflective scenes. I was sort of dragged into Theatre in high school. I was a varsity athlete in school, but somebody asked me to do a play. It went well, I guess, because I did another. 25 years later, I’m still an actor. I just look at what I think the play needs -what piece of the orchestra I am, so to speak, and play into that. I never think it’s about me or my character. It’s about the story for the audience. Well, I like when I can stand side by side with fellow company members and just laugh. Galas, salons, etc. I just like having a laugh with these fools. 7. Runyon’s characters always have colorful names. If you were to give yourself your own personal “Runyonesque” name, what would it be? And why? Actors that know me well know that I can “break” like a twig onstage. It’s awful. I can’t stop laughing. I’ll straight up ruin a scene. So they have dubbed me with the ironic nickname, The Rock. 8. What will the audience takeaway after seeing this show? Hopefully they’ll have had a few laughs, and leave with a smile on their face. 9. 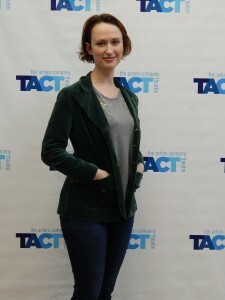 In addition to being a Company Member of TACT, you also serve as associate artistic director. What’s that like? I could tell you, but I’d have to CC the others. It’s a lot of emails, but it’s always been fun and instructive. I really enjoy the casting elements and the opportunity to contribute to the overall “look” of things -posters, flyers, etc. But let’s be real: Scott does 99 percent of everything. 10. Your character’s name is Dancing Dan. How would you describe your own personal style of dancing? Haha. My personal style is to have a drink in the corner and watch everyone else dance. I’m actually petrified of dancing in public. I need a LOT to drink to jump that hurdle. 11. What’s it like saying the distinctive “Runyonesque” words of Damon Runyon? Addictive. It tends to come home with me. 12. You’ve previously done a lot of Shakespeare in your career. Does that help you to communicate Runyon’s own very unique style of language? Eh. Doesn’t feel that way. Shakespeare is exceedingly poetic in imagery with multiple layers of meaning and has several rhetorical devices at play simultaneously. While Runyon is colorful, I don’t find it poetic. Musical maybe, distinctive certainly. But not poetic. If there’s a commonality in the writing it’s that both want to be spoken “word-perfect”. Otherwise the voice of the writer is lost. It’s a real ensemble piece, requiring all of the actors to really be present with each other on and off stage. It’s a challenge but also a joy, especially already knowing everyone in the cast and knowing how well we all work together already. It’s hard to say at this point. We’re still finding lot’s of moments in the play and discovering new things daily. I first truly decided to be an actor towards the end of college. I was in a different major, but my heart was not really in it. I loved performing and making people laugh but really had no idea how to make a living doing that. I decided I’d rather take a chance then always wonder what might have been. I took a leap of faith and it has somehow worked out so far. I read the script as many times as I can, then get on my feet and say the words. I like to rehearse and then think about all I found out about the characters at the end of each day. TACT was still mainly doing the Salon readings when I first started as a guest artist. Then I was lucky enough to be in the cast of the first full production we did under the off-broadway contract in 2006, “Home”. The salons are what drew me to the company initially. The TACT style was so unique and wonderful to watch, and then to take part in. It’s been a blessing to do both salons and mainstage shows with the company. For me, this production is a great culmination of that since it started as a New TACTics reading and now we’re fully staging the play. It’s really hard to narrow it down. I’ve been involved with the company since 2002 and a company member since 2006. 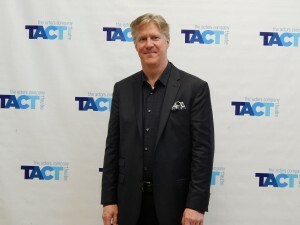 TACT has been a huge part of my professional and personal life. I’ve been in great productions, played wonderful roles, seen my fellow company members do amazing work, and made lifelong friends along the way. It’s not one memory, it’s all of TACT that I cherish. I would say “Ronnie A Capella” because I’m always singing a song when I’m happy at work. It may not always be in tune, but I’m always singing! Well, we have the luxury of fleshing out the characters and story a bit now. The readings come together so quickly and we always wish for more time to really explore the piece. It’s so great we’re able to do that with this play now and to find all the nuances of the piece. I hope they’ll have fun and enjoy the wonderful characters that make up our little story. 11. In addition to acting, you also work as the announcer on Late Night with Seth Meyers. How do you juggle the two roles? My primary commitment is to Late Night and I am there every day when we tape the show. I take on other projects that are important to me and that are able to work within that time frame. Luckily we were able to make this work and I’m very grateful to Scott Evans and everyone at TACT for that. 12. You also do a lot of voiceovers. What are some of your favorite “voices”? All the voices in my head are very dear to me. Some of them even manage to get me jobs! It’s hard to narrow it down, but right now I’m really enjoying the voice of Myrton, the British butler in the show. He’s quite fun to do. 13. What’s it like playing multiple roles in this show? How do you differentiate between the two? It’s something I’ve done before and I enjoy it. The challenge here is there is very little time to change from my first character to the second. Less than a minute, so I’ll really have to be able to make the characters distinct very quickly. The fact that one is from New York and the other is from Great Britain will help. At least, that’s my hope!